Corn Doggies - you can make corn dogs at home with our recipe. Home » Family Recipes » Corn Doggies – you can make corn dogs at home with our recipe. 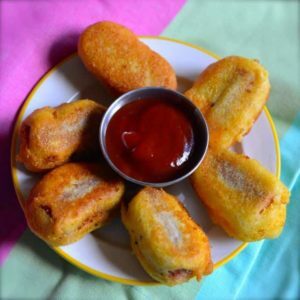 Corn Doggies – you can make corn dogs at home with our recipe. While this recipe may no longer be practical this was one of my favorites as a child. This one is obviously old, my mom used to make them like this before convenience food. You can make corn dogs at home with our recipe. Bring 3 cups of water to boiling in a large saucepan. Add hot dogs and bring back to boiling. Remove from heat; cover 20 minutes. Pour enough oil to a 2-inch depth in a skillet the and heat to 350 degrees. Combine flour, cornmeal, baking powder, salt, and sugar in a medium-size bowl and blend with a fork. Add shortening and cut in with a fork until the size of small peas. Combine milk and egg in a 1 cup measure. Stir into flour-cornmeal mixture. Pour mixture into a tall glass. Remove hot dogs from water and dry with paper towels. Insert a skewer into the hot dog, and be sure to leave about 1 inch for the handle. Dip hot dog into batter; let excess batter drip into the glass. Drop into hot fat fry 2 minutes, or until golden brown. My kids had fun making these.